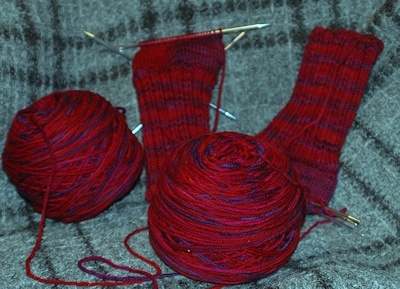 They were the secondary pair, behind the blue and green socks, and thus worked on only one or two rows at a time. I started them at DragonCon, because I could not wait to see how this yarn would knit up. But the primary pair--delayed by a couple of pairs of shorty socks for summer--had moved into serious work, and at the time of this picture were onto the feet. The Indian Paintbrush socks had to sit around with very little done on them until I finished the blue and green ones. 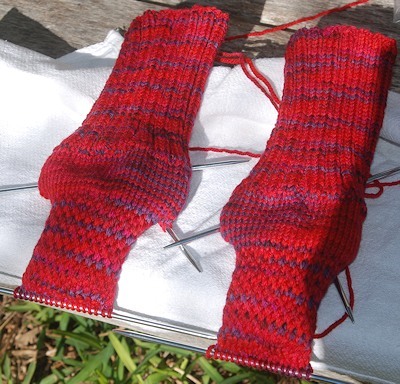 This week, the Indian Paintbrush socks are well onto the heel flaps, and now they look like this. It was cloudy and rainy today, so I couldn't take them outside to photograph them. The sock on the left is upside down, showing the change from five inches of ribbing to an inch and a half of stockinette, and the one on the right is is right-side up, showing the top of the sock--you can just see the turn to stockinette toward the bottom. The purple sections of this yarn are shorter than the shades of red sections, resulting in the kinds of stripings developed. It's really interesting on the heel flaps, but those curl up at this stage--I'll post pictures of the effect later. Pulling yarn from multi-colored balls, it's hard to match the color changes exactly (luckily, I don't care) and the variations suggest design decisions. For instance, in the sock on the left you can just see the alternation of dark and red stripes up near the needles, the stockinette part. The way it worked out, this effect is very strong on one side of the foot, and on the other sock it's on the other side. When the socks are on the foot, I'll decide whether it will look better to have the darker sections on the medial or lateral sides of the feet and the socks will get their final assignment as "L" or "R". Right now, I think it'll be better to have the darker section showing on the inside, medial side, of the ankle, but that might change depending on how the foot striping develops. In the second picture, the socks are resting on a lightweight throw woven of Herdwick wool in a waffle pattern. It's surprisingly light, but quite a nice throw to have over my legs while knitting on a cool day. Heel flaps at the needle end, where the pattern changes. Three different stitches and the effect of the yarn color change looks completely different in each. Once past the gusset shaping, the feet should look most like the stretch of stockinette between the ribbing and the heel flaps. (Flash or no flash, It's a lot easier to photograph knitting-in-progress outside!) Since the circumference will be 4 stitches less than the ankle stretch of stockinette, however, the shorter stretches of darker-colored yarn will go a little farther. Don't know yet if they'll end up on the top or bottom of the foot, or more to one side, as they are here in the ankle section. 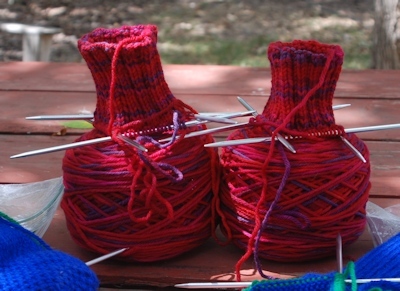 This image shows what will be the back of the sock, of course--where the heel flap is. So the sock on the left will become the actual left sock, and the sock on the right will be the right sock. One of the things I'm discovering, with hand-painted yarns (or any variegated) is that the pattern of striping looks completely different depending on whether you're doing ribbing, stockinette, or the heel reinforcement stitch. I'm fascinated, and it keeps me interested. Also, when I changed the number of stitched to fit the sock more precisely (ribbing is 60 st., the stockinette below is 56, and it's reduced to 52 in the foot) that affects how the stripes lay out, even in stockinette, which is the smoothest. I'm sure needle size would affect it, too. What wonderfully warm red tones! Perfect socks for winter wear. The heel flap reinforcement pattern really shows up well in this yarn. I should make it to heel turns today.